Scientists warned 30 years ago that global warming ‘is in our living room.’ Data show they were right. (Jay Janner/Austin American-Statesman file photo via AP) In this Aug. 29, 2017, file photo, Javier (no last name given) catches a carp in the middle of Brittmoore Park Drive in west Houston after the Addicks Reservoir overflowed due to days of heavy rain after Hurricane Harvey. On average, during the past 30 years there have been more major hurricanes (those with winds of more than 110 mph), they have lasted longer and they produced more energy than the previous 30 years, according to an Associated Press analysis of storm data. Salida, Colo. • We were warned. 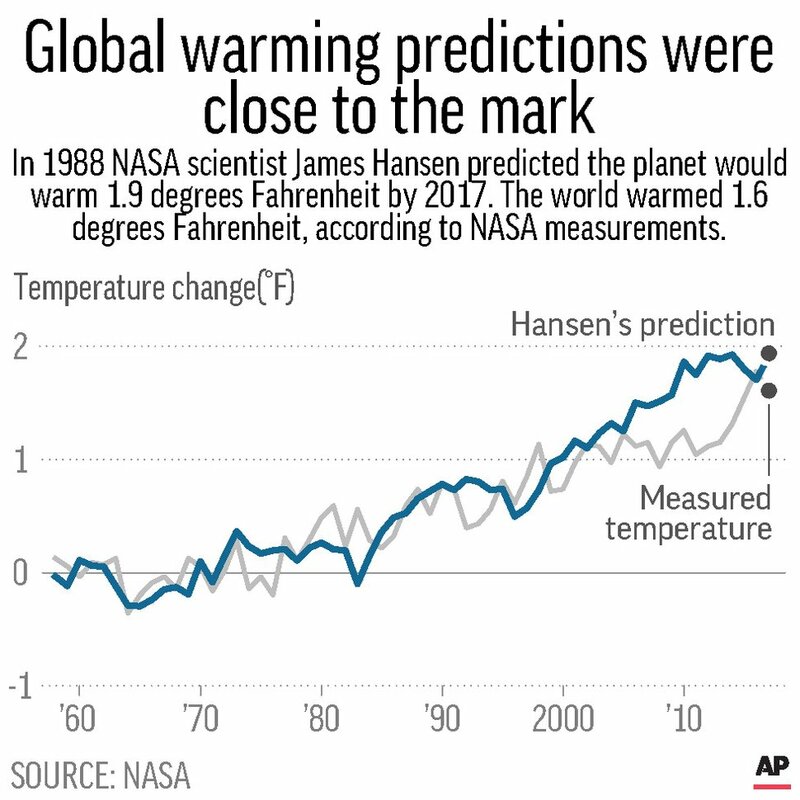 Chart shows projected temperature change from James Hansens 1988 model compared to temperature change measures from NASA. Over 30 years — the time period climate scientists often use in their studies in order to minimize natural weather variations — the world’s annual temperature has warmed nearly 1 degree, according to the National Oceanic and Atmospheric Administration. And the temperature in the United States has gone up even more — nearly 1.6 degrees. 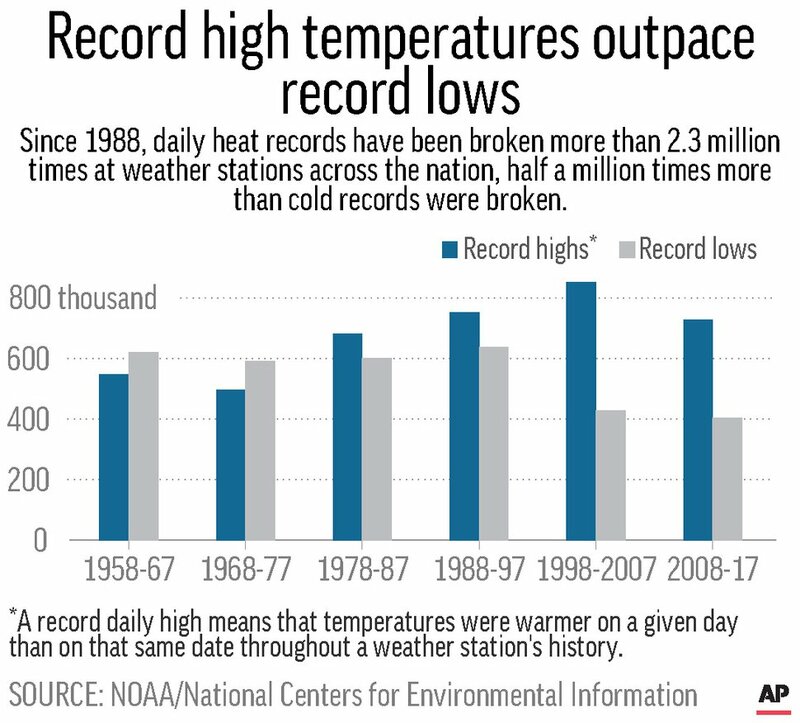 Chart shows record daily highs and record daily lows by decade from 1958 to 2017. Since the 1800s scientists have demonstrated that certain gases in Earth’s atmosphere trap heat from the sun like a blanket. Human activities such as burning of coal, oil and gasoline are releasing more of those gases into the atmosphere, especially carbon dioxide. U.S. and international science reports say that more than 90 percent of the warming that has happened since 1950 is man-made. 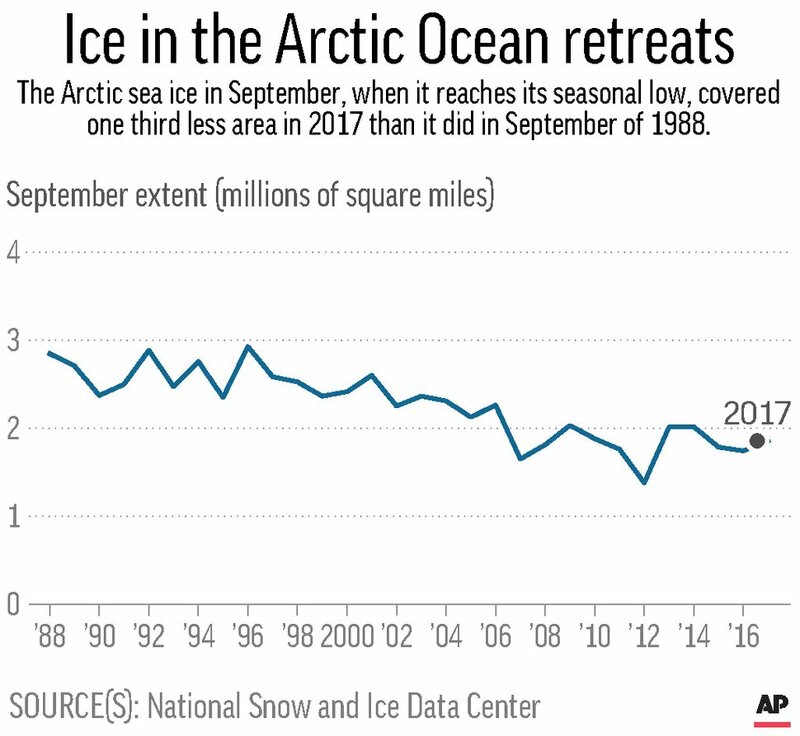 Chart shows the extent of Arctic sea ice in September from 1988 to 2017. Alaska’s annual average temperature has warmed 2.4 degrees since 1988 and 5.4 degrees in the winter. Since 1988, Utqiagvik, Alaska, formerly known as Barrow, has warmed more than 6 degrees yearly and more than 9 degrees in winter. Ice sheets in Greenland and West Antarctica have also shriveled, melting about 455 billion tons of ice into water, according to the NASA satellite. That’s enough to cover the state of Georgia in water nearly 9 feet deep.